Fanny's Favorite is a block name used on a few different blocks. So, I have added the words "a variation" to the end of the block name. This quilt block is a wonderful choice to use as a teaching/learning experience. I have added it to the Intermediate level of difficulty, simply because of the number of pieces in the quilt block. The block uses half square triangles, lots of squares and rectangles and also flying geese units. By taking your time and being aware of your precision in the seam construction, you will have no difficulty in creating this really interesting block. 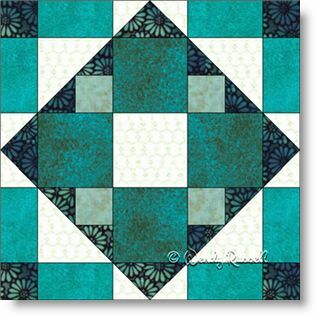 The sample quilts illustrated show how this block can create a secondary design, by placing them side by side. Or add in plain blocks to showcase your quilting skills and make a totally different looking quilt. Imagination is all you need. See also a simplified Fanny's Favorite quilt block pattern.